The rate of vacant houses by county: brighter counties have a higher vacancy rate while darker counties have very low rates; the twenty most vacant (pink) and least vacant (blue) counties are listed. Apparently, if there is a house in Virginia then somebody is living in it -home of eight of the twenty least vacant counties. The data comes from the 2010 census (vacant housing units as a proportion of total housing units); here's some background on that data. Did you know the number of vacant houses increased by over 40% between the 2000 and 2010 counts? That's a little misleading because the number of homes, overall, increased wildly over that same period. So here's a map comparing the rates of vacancy -which I think is a little fairer. I've been getting a lot of feedback about the nature of the vacant houses -that many of them might very well be vacation or second homes. This absolutely may be the case. For example, the Nantucket is among the most vacant of counties, but it is very likely that this is due to the large proportion of seasonal living there. But, nonetheless, it's a vacant house and I don't seem to be able to find some qualifier for second residence in the census data. Though I hope nobody thinks that this map implies a strict association of severe economic turmoil -it's just vacancy rates. 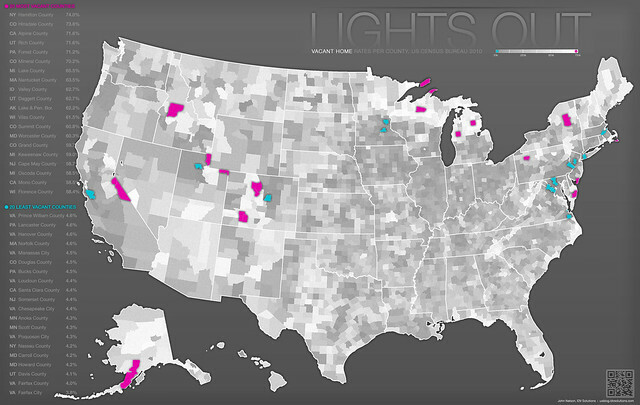 Yes, In my state, Utah, the two counties in pink are areas high in vacation/second homes. This is really interesting, Matt. A perfect example of maps sparking questions about data that you wouldn't have thought to ask! Does anybody have an idea of where I could find county-level data on second/vacation homes? Not all the spatial entities here are counties, e.g., Fairfax City in VA where the cities may be within a county but are not a part of it. I would also be interested in learning why the gray scale reverses the conventional "darker = more" approach. The legend is also overly small and difficult to identify. Wealthier individuals may own more properties. This could affect the figures. The figures are worth noting. It's one factor in conveyancing in Darwin.